Michael Gehan, M.S., CCC-A, is a husband and father to his son and two dogs. Michael is an avid sports fan and loves cars. When Michael has free time he can be found working on his car with his son beside him as his helper, riding his bike, or at one of his son’s sporting events. Michael believes in “making a difference in people’s lives through building relationships with each person and providing the highest level of care.” Michael does this by “focusing on each person’s individual needs.” Following a comprehensive evaluation Michael personalizes a care plan to meet the person’s specific hearing needs. Michael is dedicated to helping people hear and process sound. Michael’s extensive experience, knowledge, and the knowledge he provides to people has lead to positive successful results. Michael believes that “education leads to a person’s success.” Michael spends extra time with each patient to make sure they understand the results of his evaluation and personalized care plan. Continued education is very important to Michael. He is actively involved with obtaining the most current cutting edge information about hearing, hearing aids, and central auditory processing. Michael specializes in advanced digital hearing technologies, diagnostic audiological testing, transitioning individuals from hearing loss to successful hearing aid use, and central auditory processing. Michael co-founded Achieve Hearing & Rehabilitation in 2005 because he believes everyone deserves to hear. His goal is to help people achieve a balanced life. Michael has over 15 years of experience working with adults and children. Prior to opening Achieve Hearing & Rehabilitation Michael worked in various medical setting with ear-nose-and-throat (ENT) physicians. 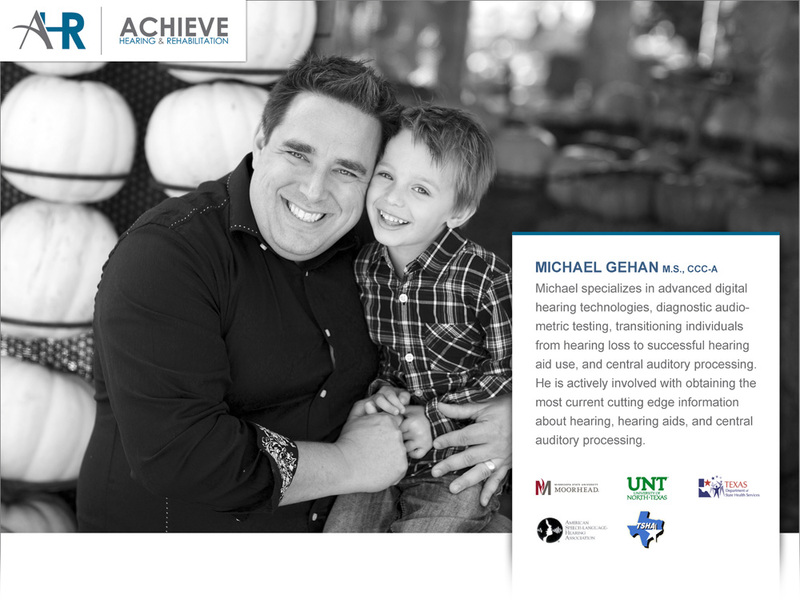 Michael has had the opportunity to partner with several companies, organizations, and the Texas Speech and Hearing Association (TSHA) to provide education about central auditory processing disorders, hearing, and hearing aids, and aural rehabilitation. Michael was featured in the “Ask the Experts” section of D Magazine’s annual medical directory for Colin County. Michael provided information about how hearing impacts a person’s life and how recent hearing aid technology can benefit people with a hearing loss.